I have to confess, lately I've handed over the egg-collecting, chicken-feeding duties to my children. While I enjoy a good trek to the coop with my morning cup of coffee, I've been letting the girls handle the chore. I haven't been to the coop for much more than a nightly lock-in, in quite awhile. Apparently, it's been ooooh, about 21 days. Precisely the amount of time it takes for something magical to occur in an un-monitored nesting box. 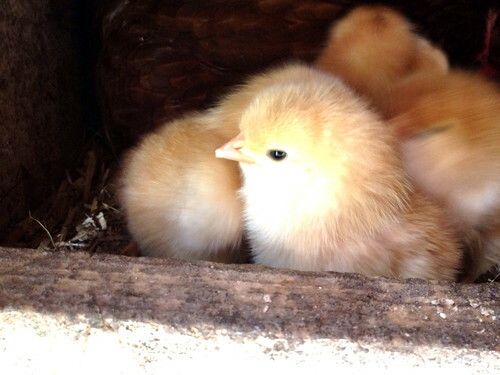 This morning, the children on chicken-duty came blasting back into the house to let me know we had baby chicks. No, we don't, I told them. Silly girls. But I followed them out to the coop and before I even got to the door, I could hear that familiar peeping. And there, perched in her nesting box was one of our Rhode Island Red hens with EIGHT little fluffy chicks tucked under her breast. This, by far, has been one of the best surprises ever on our little farm. But I couldn't share this story without acknowledging that the chick's arrival today is full of irony. Just yesterday, there was another rooster attack–this time on Elizabeth. It meant another call to my husband reminding him that something had to be done right away. And so yesterday evening, we all hid in the house, covering our ears while Dan took care of the rooster situation. And sparing details, the task proved to be quite complicated. But today, those roosters, in a final statement of their immortaltiy and unwillingness to leave this earth, leave us with eight fluffy legacies. And chances are, I'll find myself attempting to befriend a rooster (or two! or more!) all over again. Oh, how exciting! Let’s hope those legacies are pullets! My experience is alas, no, that approach doesn’t work with the vegetable garden. Mine contains nothing so adorable as baby chicks. oh, molly! what a fun surprise! They are so cute!!! And I was also laughing at the vegetable garden comment. If only! we had this happen! I hadn’t been using the greenhouse, and one day I walked out and heard peeping! I love the irony in this! What a pleasant surprise! So cute! And how ironic indeed!! 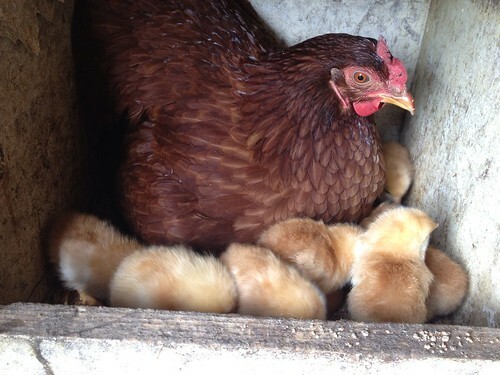 Perhaps the cutest result of chicken neglect I’ve ever seen. Fingers crossed all eight of those are not roosters. We are raising the second “surprise” brood right now. Our insistent mothers brooded them outside, tucked away in bushes I presume, and we weren’t the wiser till the cheeping started. Sweet surprises, indeed! 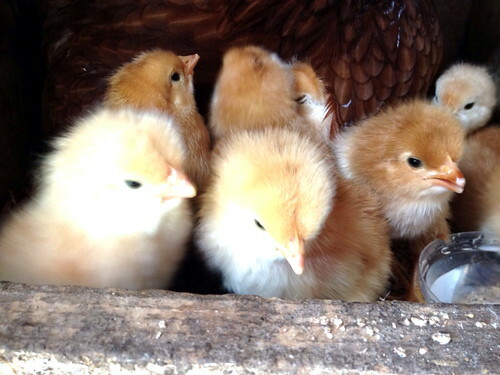 Your surprise chickies are adorable. I did this very thing last year and all I was rewarded with was rotten eggs. How wonderful! 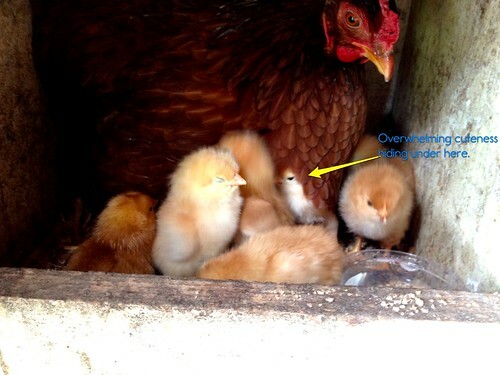 I bet you couldn’t get a brood of 8 chicks if you tried…just let nature take its course! :o) Lovely! How sweet! I’d rather like that kind of surprise! Are you having coq au vin for dinner? What do you think the chances are of having eight girls? I bet the girls are over the moon. So sweet, what a wonderful surprise!! How delightful. 🙂 We’ve had our share of rooster troubles, too, but have been very happy for several years now with a silkie rooster. Silkies are bantams, so he’s not any bigger than my regular hens, and very mild mannered. Wow! This post hits home for me on so many levels. We had a surprise rooster in our batch of spring hens and our 4 girls begged for the rooster to stay. He was so pretty. And he, too, attacked my girls. A few weeks ago I sent that same email to my hubby, and our rooster ended up back at the hardware store before the ladies were laying. So no surprise chicks for us. But your post showed me what could have been 🙂 They are so cute! Whenever you have a post about your chickens I have to read it to my aspiring farmer. She wants chickens terribly bad and is trying to learn anything and everything about them right now. This post had her smiling from ear to ear. I’m pretty sure she is secretly, OK maybe not so secretly, hoping that when we get our chicks this spring there will be a surprise rooster among them. Any book recommendations for kids (and their mommas) learning to raise and care for chickens? Lucky you! I keep waiting for this to happen on my farm, but I’m far to particular about finding every last egg, every single day… I’ve recently decided, though, that I’m going to use hen-power for hatching new chicks instead of the incubator, so the next time a hen goes broody, we’ll give it a go! Brava to your Mama Hen! I keep coming back to this post because I just love this story. As a keeper of hens and collector of eggs, I know very well a broody hen. We have no roosters here though, so I shoo my broody hen off the eggs. What a great surprise for you and your girls.